Visit our country heritage treasures website here to find out about more people who keep country skills alive and kicking. Read more here. 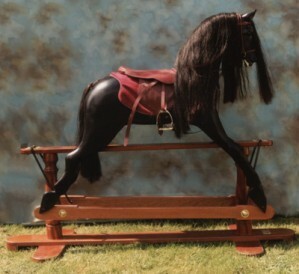 There are few children’s toys as looked upon as fondly as the rocking horse. The history of the toy stems back to the middle ages when rocking horses provided a training tool for knights who wished to practice jousting. Then Queen Victoria cemented its place in society when, in 1851, she famously visited the workshop of J. Collinson in Liverpool and chose a dapple grey to take home. Today the art of the rocking horse-maker remains a highly skilled trade, and Robert Mullis’ horses are among some of the finest, and have been exported to destinations as far away as Japan and Australia as well as having been viewed by the current reigning monarch. Robert became interested in rocking horses 40 years ago when he saw one being restored at the agricultural contractors’ where he worked as an apprentice. ‘I realised that they were made from lots of different blocks of wood and that fascinated me.’ The horses are in fact made from 30 to 40 different wooden blocks, commonly sycamore or British hardwoods such as oak. Each horse takes an average of 55-60 hours to make. Then the horses must be painted and fitted for tack (all Robert’s horses sport tack made by a specialist saddler). Much-loved rocking horses often end up needing to be restored: ears and legs are common casualties. ‘Restoration is preferable to replacement as the horse retains more value that way,’ he says. The worst affected parts of the horse are broken down into individual blocks of wood and repaired before being reassembled. Most of the horses are made to order and commissioned ostensibly for children but all are strong enough to take adults. ‘Adults like them just as much as children, if not more. I test each and every one I make by standing on them and until recently I weighed 17½ stone.’ Robert’s bespoke horses are highly individual; hair colour, tack, style, size and even eye-colour vary and he offers a full refund should a customer be unhappy with the finished result, but, happily, as yet, not one horse has been returned to its maker.